Easiest Party You'll Ever Have! WEATHER: We cannot control the weather. If we cancel your delivery due to inclement weather, you can choose to receive a refund or you can reschedule. Inclement weather can be, but are not limited to high winds (20 mph or more), precipitation, thunderstorms, and cold weather (45 degrees or colder). Please note that these policies are specific to inclement weather conditions only and in no way apply to normal weather conditions. If the weather is questionable, we will contact you the day prior or the morning of your event to discuss options. We cannot set up in high winds or if it is actively raining, due to increased chance of injury or electrocution. You will be given the option to cancel prior to delivery. If you chose to have us come and we are unable to set up due to the weather conditions listed above, you will still be charged for your rental. Grins and Giggles Inflatables reserves the right to cancel a reservation due to inclement weather such as the conditions listed above. Please call 325-725-0977 if you have any questions. 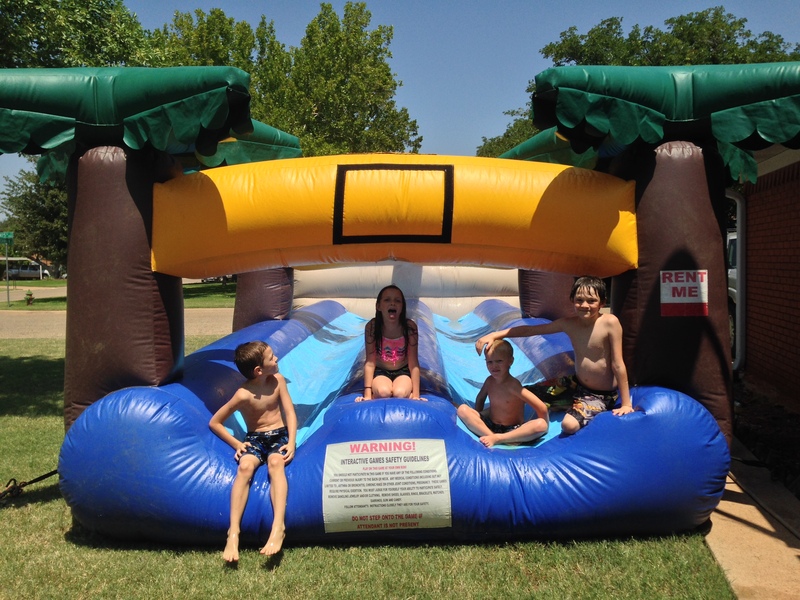 WARNING: INFLATABLE UNITS MUST NEVER BE USED WHEN WET INSIDE (except for waterslides) and/or WHEN WINDS ARE 20MPH OR MORE. Inflatables become very slippery and dangerous when wet. In these situations the inflatable unit MUST be evacuated and deflated until the winds die down and/or the rain stops. Once the storm passes re-inflate the unit and dry off the inside before using the unit again. DEPOSIT & CANCELLATION POLICY: A non-refundable deposit of 50% is due in order to secure your reservation. You are welcome to cancel for any reason prior to your event and your deposit will be honored for a year. If we cancel your event due to inclement weather, we will issue you a full refund. We understand things come up, and most events are planned months ahead of time. Grins and Giggles Inflatables reserves the right to cancel any reservation or portion of a reservation or shut down an event early due to Inclement Weather, unsafe, unclean, or unfit area for unit, or any other situation that the company deems dangerous or jeopardizes safety in any way or is not in the best interest of the company.